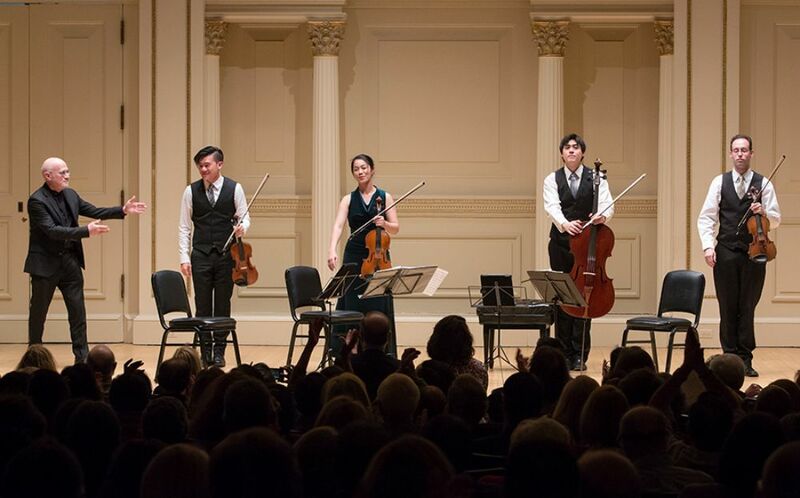 Performing some of the most daring repertoire of the 20th and 21st centuries, the Telegraph Quartet—winner of the 2016 Naumburg Chamber Music Award and SFCM’s quartet-in-residence—dazzled an eager, sold-out crowd at Carnegie Hall on Tuesday, February 6. 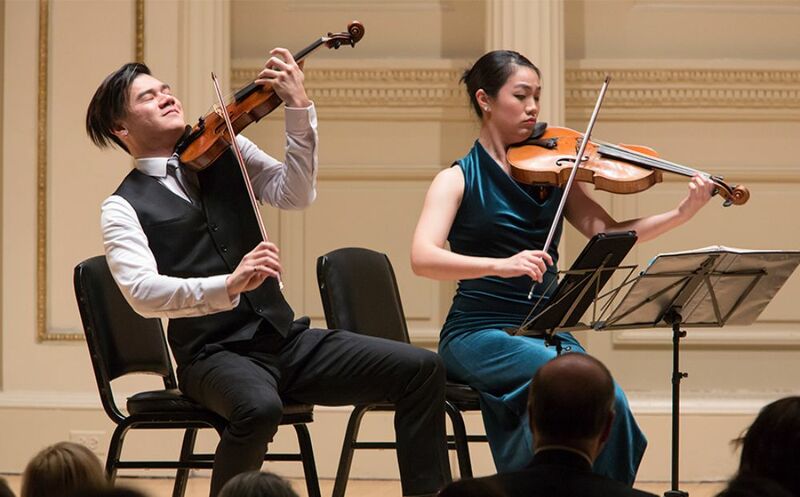 The recital in Weill Recital Hall, which is included in the award, was presented by the Walter W. Naumburg Competition. 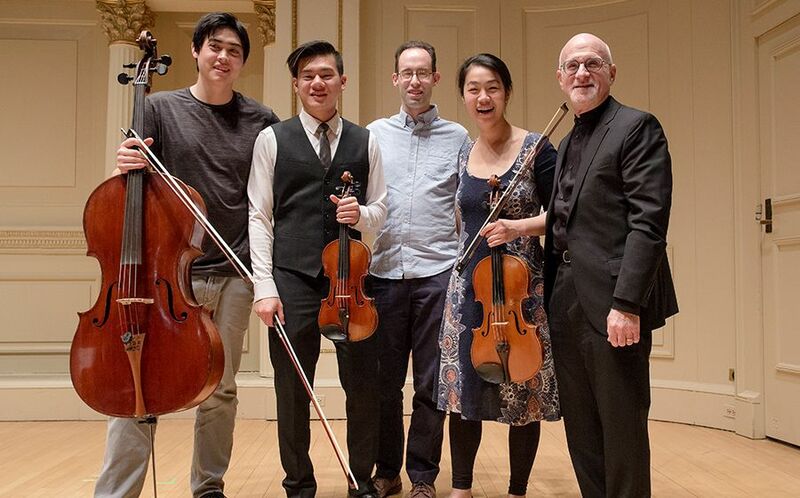 Comprised of violinists Eric Chin ’12 and Joseph Maile ’12, violist Pei-Ling Lin ’12, and cellist Jeremiah Shaw, the Telegraph Quartet took on the first string quartets of Arnold Schoenberg and Leon Kirchner in addition to giving the world premiere of Robert Sirota’s String Quartet No. 3, “Wave Upon Wave.” The critics’ impressions of the concert reflected the sentiment from the audience in the multiple standing ovations the Quartet received. And conquer they did. The end of the concert saw a rapture of applause, and from the beaming smile on Sirota’s face, one could tell that everyone in the room—audience and performers—was beyond satisfied. Attending the concert was a large contingent from the SFCM community consisting of dozens of Conservatory trustees and supporters who flew to New York to witness this special event. Faculty members Jonathan Vinocour and Ian Swensen (Chin’s and Maile’s teacher) also traveled to New York and a number of SFCM alumni currently living in the city attended, as well. It was a show of support on a national scale. 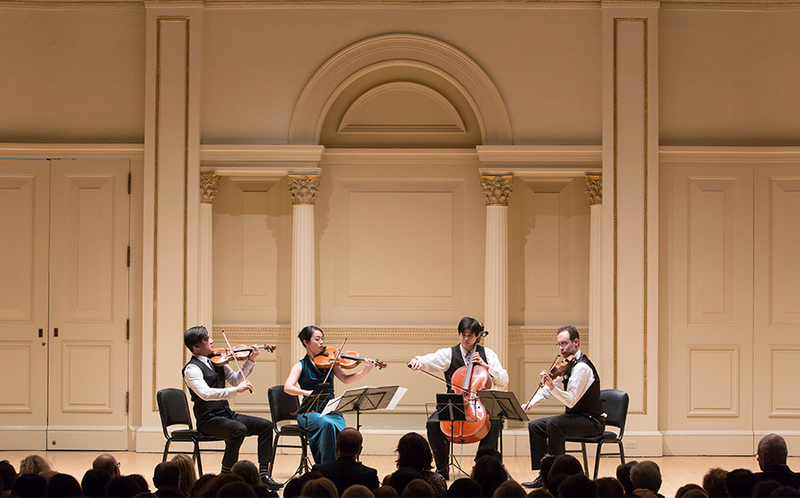 This wasn’t the only New York event that put the Conservatory in the spotlight. 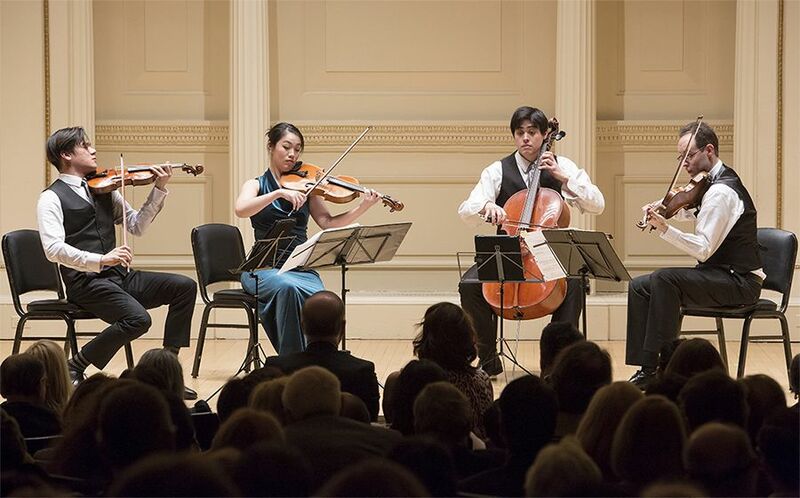 As part of SFCM’s Centennial Celebrations in New York, the Conservatory hosted a panel discussion at New York Public Radio’s The Greene Space on the Monday before the Telegraph Quartet’s recital. In addition to attracting SFCM community members—the same trustees and alumni who showed their support for the Telegraph Quartet—the event, centered around a public conversation titled “Playing to Win: Music in the 21st Century,” drew industry professionals from management and public relations companies, publishing firms, and other organizations. The panel, moderated by Nadia Sirota, included participants Jeremy Geffen (Senior Director and Artistic Advisor, Carnegie Hall), Isaac Thompson (Vice President, Artistic Planning, New York Philharmonic), Claire Bryant '03 (SFCM alumna and cellist and Co-Founder of Decoda), composer Marcos Balter, and SFCM Trustee Payam Mirrashidi. After an introduction by SFCM President David H. Stull, the panel took off tackling both the challenges and opportunities in the music world. Geffen and Thompson both eloquently offered their perspectives as experienced administrators, commenting on the success they’ve seen at their respective organizations taking risks in programming that have paid off with audiences and critics. Geffen was keen to note that “it’s okay not to like something”—the conversation you create from the programming itself is a driver of the art form. Bryant spoke about her time at SFCM, reflecting on the “try everything” attitude she developed as a result of her professors pushing her to engage with music from all angles, leading to the success of Decoda. Marcos Balter and Payam Mirrashidi both commented on the pluralistic attitude that is a strength of adventurous programmers and that we are currently seeing on digital platforms like Apple Music. Intimate, casual, and full of laughs, this panel discussion sharpened a sense of purpose with a look to the future of music.